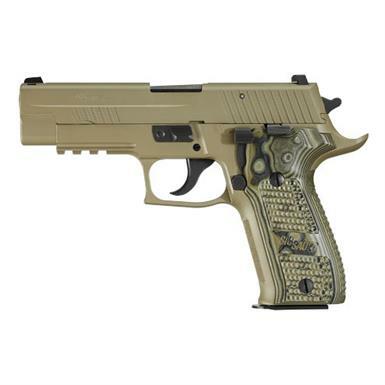 SIG SAUER® P226® Scorpion CA Compliant Semi-automatic Handgun. Ready for battle (and for California). The gold standard for combat handguns! Designed for the U.S. Army and carried by U.S. Navy SEALs, Texas Rangers and many other elite military and law enforcement professionals, the SIG SAUER P226 Scorpion has earned a stellar reputation for reliability and tactical excellence. Exceptional ergonomics and balance make this full-size pistol easy to handle. Plus, the P226 features a longer barrel for superior ballistic performance and accuracy. This California-legal model includes magazine safety and loaded chamber indicator to comply with state law. Take aim with an industry leader.